I have mentioned before that I don't want to give up the things I enjoyed before I had children. 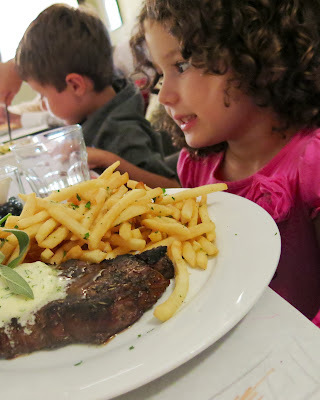 Well today I decided that I would bring my 4 year old and 6 year old to a classy delicious French Bistro. 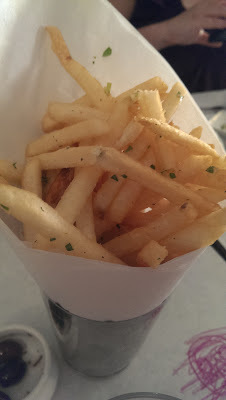 You may have read my review in April about Dominique's Kitchen. From the moment I walked into this cozy restaurant, I knew I had found a favorite SoCal spot! Wonderful wine, food and company, Dominique's Kitchen provides it all! I loved how Dominique comes himself and greets his guests. For that is the way that I felt when we visited, guests. 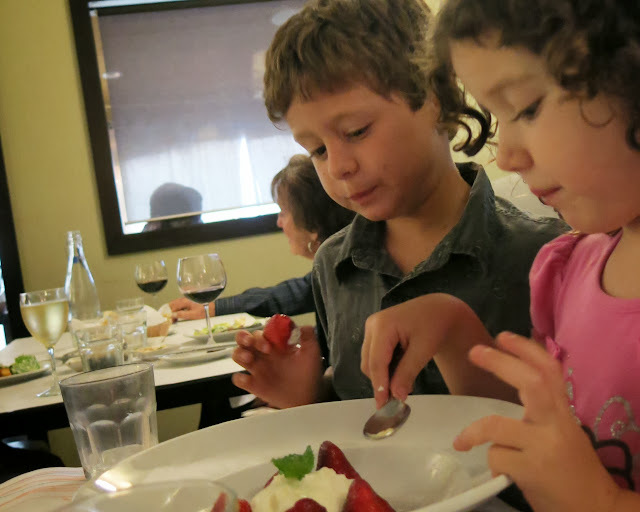 I have learned that even though we try to continue to do pre-children activities as often as we can, usually a restaurant with linen napkins and a large assortment of great wines is not the place for young children. Being a French restaurant, could they even appreciate the cheese or pate plates? Would there be food that they would eat, their tastes vary from hour to hour! Would they be too loud for other patrons in the dining area? When I received an email asking if we wanted to experiment and see what kind of kid friendly foods would children like, I was excited! Dominique's Kitchen was branching out and trying to reach a younger family friendly audience. I can't say that I was without trepidation! My son who has ADHD has a hard time sitting still in the best of circumstances. My daughter who's sole purpose in life is to aggravate my son... well you get the idea. I realized that I had to do everything I could as a parent to make the fine dining trip into a pleasurable one for not only the patrons but more importantly my kids. Kids don't get a lot of choices in life and to ask them to sit at a fine dining establishment like Dominique's Kitchen, for 2 hours is asking a lot. First thing I did was to prepare myself and my children. I brought along our Kindle stocked with educational games for them to play and coloring items. This allowed the children to be children and the adults around them to be adults without loud children. 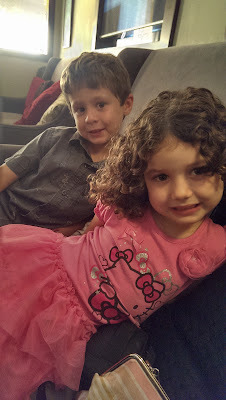 I am not saying my children were perfect. By all means I was ready to march them back home! Of course since there was only one Kindle, they fought over it. Crayons? Yup they each wanted the same colors at the same time! They both wanted all of the garlic fries and one always had more than the other! Sigh... Flexibility and understanding... I need more! The tables have white paper covering the top and it made the perfect easel for my budding artists. 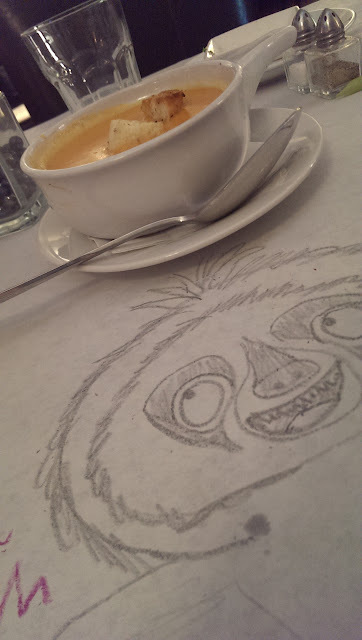 Even I got involved, showing off my new drawing skills I learned earlier in the week at DreamWorks Studios. The waiter was quick to take our order and was very attentive. As parents you know that the faster the service, the faster we have content children that will not disturb others around them. They understood that and never rushed us but let us know that they were flexible and available. From the moment we walked in the door, all of us were treated to smiles and greetings from the staff. They took the time to get to know my children's names! They talked to them like they were small people, not trouble makers. Sitting us down at the VERY comfy couch with large squishy pillows sounds heavenly until you realize your children just found out how bouncy the couch was. Double sigh... out comes the activities I brought. 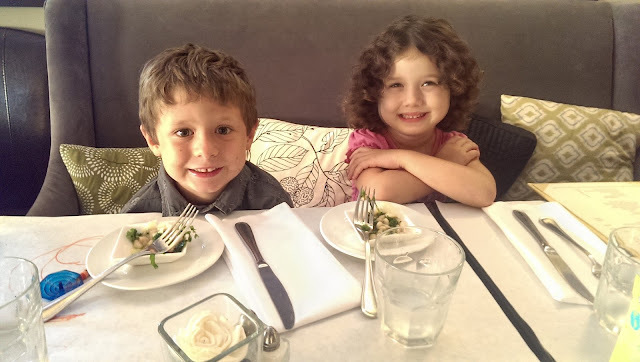 The choice of giving my children whatever means to keep them content so that I may enjoy a delicious meal with fellow blogger, Erin of Horsing Around In LA, may seem selfish but adults should be able to sit at quiet dinner even with young children at hand. It also is appreciated by the other patrons. 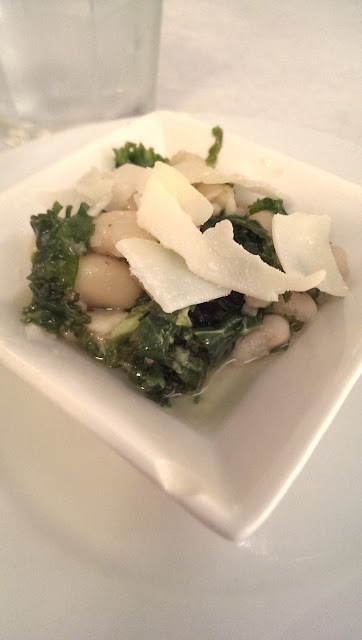 From the time we sat down, we had appetizers such as this white bean and Parmesan sampler. We looked over the menu and decided on what looked like would be the most likeable candidates from the menu. We chose garlic fries and tomato soup for the appetizers. The kids dove into both! 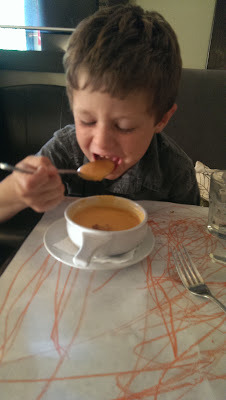 In fact my son was dipping the fries into the soup and loved it! 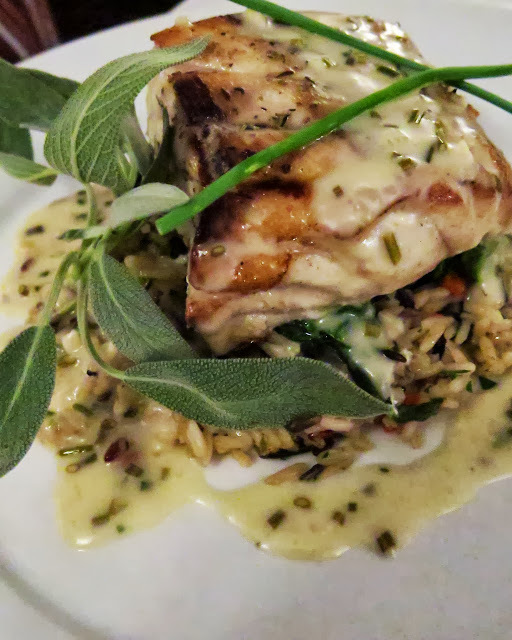 For a main dish, I chose the special of the day which was a seared New Zealand Ling Cod over a bed of rice/potato medley topped with spinach with a champagne sauce. Yumm! Erin chose the Wild Boston Sea Scallops with crushed potatoes, shallots, parsley, garlic, lobster reduction au jus. 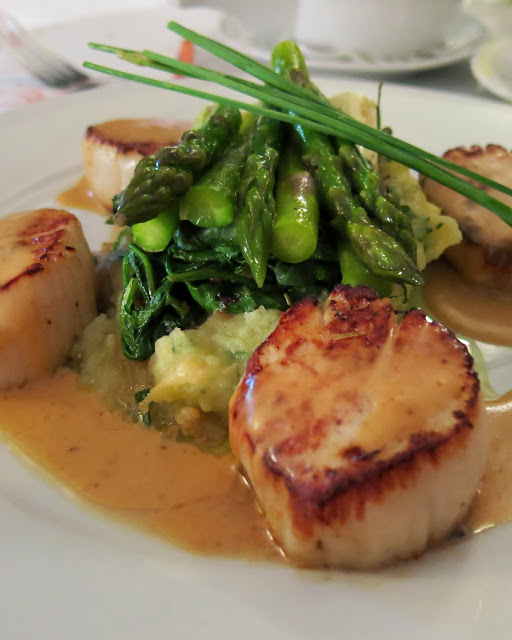 If you like seafood, you will love these perfectly prepared sea scallops! My children chose the steak and macaroni and cheese. 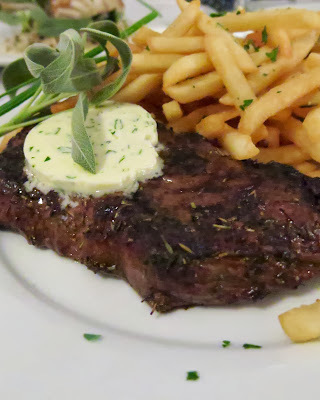 The steak came with a large portion of our favorite garlic fries and was perfectly seasoned grilled topped with a lemon butter sauce. 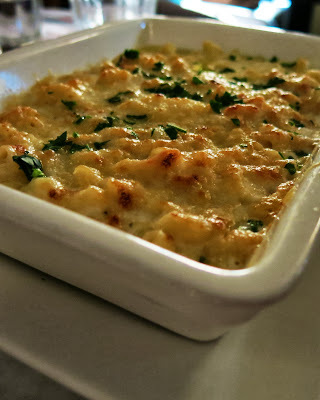 The two cheese macaroni gratin was devoured by them like sharks in a feeding frenzy! I tasted it and wished there would be leftovers for later. After our tummy's were about to burst, of course the dessert menu comes. My previously full children, assured me that they had room for more. What to choose... 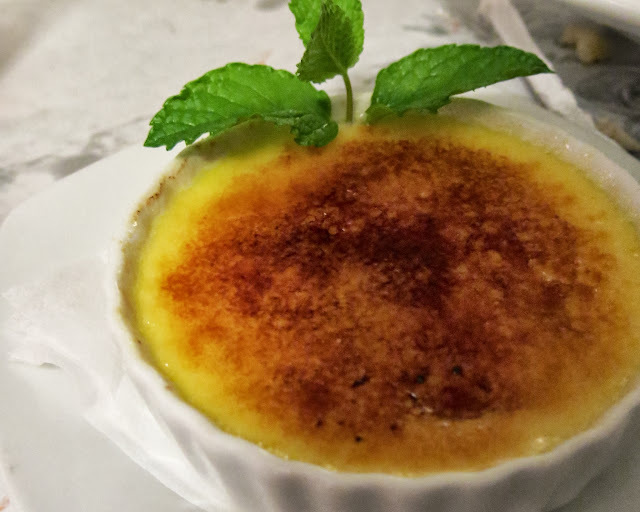 It couldn't be too exotic so I chose the Strawberries with Whipped Cream Fraise for them and my absolute favorite, the Passion Fruit Crème Brulee for myself. 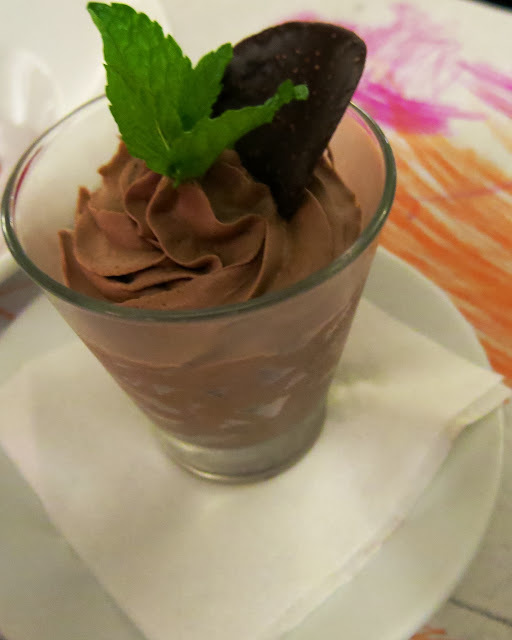 Erin chose the chocolaty goodness that was the dark chocolate mousse. We were not disappointed! We finally couldn't eat another bite. I consider this dinner a complete success in the fact that we received no dirty looks and received an excellent meal from one of my favorite restaurants. I survived a nice sit down meal with two children that can be at their best and worse at any given time. Did I mention how absolutely delicious the food was? 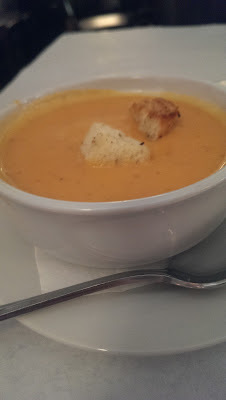 If you haven't tried Dominique's before, please stop in and try it out. Mondays are happy hour and if choose to go then, do not leave without the fried kale! I have dreamt about it... seriously! DISCLAIMER: I was invited to help kid/taste test for Dominique's Kitchen. We were treated to dinner. All thoughts are my own. Do not use any pictures without permission. The food looks yummy. Wow and the proportions = HUGE! Glad you were able to take your kids with you! The food looks delicious!!!!!!! I know I had this assumption that French restaurants are stuffy and uptight but you make me feel like I'd love this place! I love this place but I do have to warn you... if your child asks for a substitution, they will not do it gracefully (my example: my son wasn't feeling 100% and just wanted pasta so he asked if he could have the only pasta on the menu - which had salmon on it - WITHOUT the salmon). They DID NOT warn us that they would be charging us the full price for the dish which was now, literally, a plate of spaghetti with butter on it for $13.99! When we got the bill, the waiter shrugged and said that Dominique doesn't make special exceptions... not even for children. 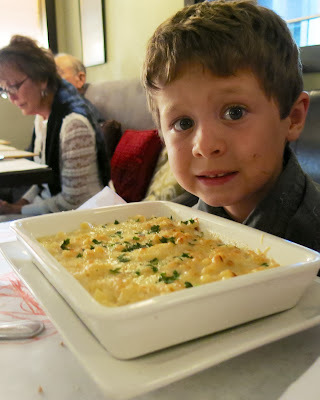 Just my experience ... my son is very well behaved in restaurants (so I have different concerns than this blogger) but his tastes in food are not sophisticated enough for this to be a viable restaurant choice when we go out with the whole family. 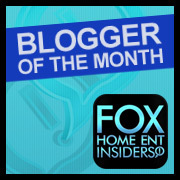 We are very sorry to hear about this misunderstanding! Your server was clearly mistaken and it is our policy to always give a child-sized or half portion if requested and will charge $9.99 for it. While the restaurant does not charge less for dishes where items are left off (this would become too confusing for everyone), we are happy to make smaller portion sizes for less. Also, we do offer other pastas including a vegetarian penne and a macaroni and cheese that tend to be more kid friendly. We would love to have your family back and your son's next meal would be on the house. Feel free to email dominique@dominiqueskitchen.com with anything else you would like to share or if you would like to make a reservation.